Guess what there is a new code available for FREE Kellogg’s Family Rewards Points! To redeem your 50 FREE points to your account, all you have to do is enter code NUTRITIONINABOWL. Code expiration unknown. 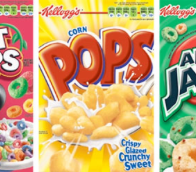 Kellogg’s Family Rewards is an program where you get exclusive coupons and earn rewards from your favorite Kellogg’s brands. If you aren't yet a member go here to join then you can also Enter code JOINKELLOGG2SAVE to score 50 free points when you register today!